Alpine skiing, snow skiing, downhill skiing, snow sports, free skiing, snowboarding….call it what you will, the sport of skiing on snow befuddles many people. Why do we ski? Why? Its cold, and scary – riding a crazy suspended chair up a hill in winter only to then let gravity pull you back down on long metal edged boards, gripping sharp pointy poles in your hands as stabilizers, sliding on slippery snow covered slope in below freezing temperatures at the risk of falling, then do it again repeatedly at significant cost? Because…skiing is a fantastic activity in winter. You are outdoors embracing the fresh cool air,arriving on the summit of spectacular mountains with phenomenal views, surrounded by sparkling glittery snow, feeling the rush of accelerating down a snowy slope, making sweeping turns, feeling the power of your quads as you master the mountain. This sure beats sitting on the couch inside all winter waiting for the snow to melt. Speaking of couches, ski resorts have flying couches – quad chairlifts that whisk you up the mountain in the comfort and company of fellow skiers and riders with whom you will share stories of ski adventures across the ski area, the country and the planet. Skiing is a rare sport that you can participate in with friends and family members of multiple generations. You can ski with your grandparents, your parents and your kids. Skiing is an independent sport, you take at your own pace, it is non-competitive, and self controlled – or at least it is intended to be. 1. Learning how to ski requires good physical condition. 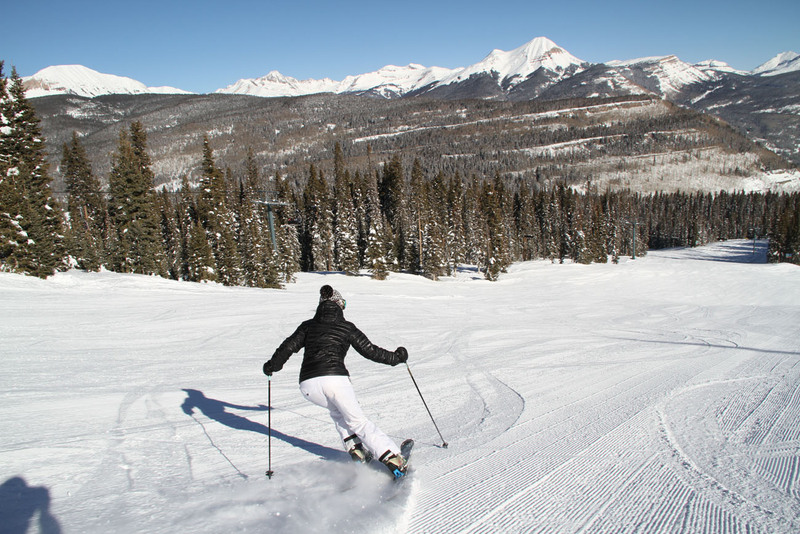 Skiing is a dynamic sport and you need strong quad muscles and a good core strength. Balance is important too as you will do best if you are comfortable and centered on your skis or snowboard. See our Guide to Ski Fitness, do your sit ups and squats in preparation before for your first ski lesson. A flexible fluid athletic stance is important in skiing, you don’t want to be stiff on your skis – and you don’t want to be sore the next day. 2. Get a lesson. Learn to ski from the experts. Don’t let your friend convince you that you can just get a on chairlift and manage your way down the mountain. This is a recipe for disaster, or at least injury to you or your friendship. Ski instructors take you from the first step of familiarizing you with your ski equipment to standing and sliding on your skis or board, to gliding down a very gentle beginner slope before you ever load a lift. 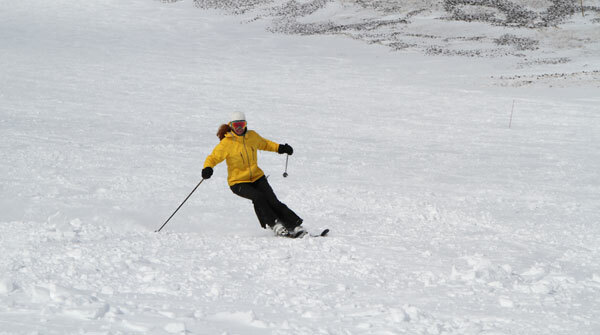 Proper ski technique is important from the start – arms in front, knees slightly bent, eyes forward, quiet upper body. 3. Get set up with the proper ski gear. You don’t need to buy brand new ski equipment for your first time on skis. Rent gear from your local ski shop or the ski resort, you know – try before you buy. 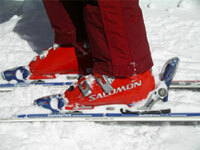 The ski boot is the most important part of your ski outfit – comfort and support are key. Ski boots feel weird, and are admittedly awkward to walk in – but boots should fit snuggly as that is the connection between your body and your skis. Ski techs will set you up with the right length of shaped skis, and adjust your binding DIN setting according to your height, weight and ski ability level. This assures that the ski binding will stay on and release in the event, or likelihood, of a fall when it is appropriate and safe to do so. 4. Have the right attitude and expectations. You will not learn to ski the mountain in a day, but you will learn to slide on snow and learn to stop and hopefully learn to turn both ways on your skis in your first lesson. If you are athletic, optimistic and game, you should be able to ride the magic carpet and descend on the beginner slope for several ski runs. Some skiers even make the chairlift in the first ski lesson. 5. Loading and unloading the chair requires some instruction as well- so familiarize yourself with the lift- whether it is a high speed that slows down for you to sit, or a fixed grip which comes around the bull wheel quickly. You need to be ready for the timing, able to move out to the lift load area quickly and to stand up and descend the off ramp at the top with balance. 7. Watch the weather and dress accordingly for skiing – layers are key since it often starts out cold on a ski morning, but as the sun gets high in the sky – and you are exercising – you tend to warm up. Shedding a layer, or that face mask, will feel good after noon. See our list of what to pack for a ski trip, ski day or ski week. 8. Continuity is key – like any sport, the more you ski, the better you get. Ski your age in days… an exponentially fun goal. 9. Start at a small local ski hill, you don’t need a big ski resort with huge vertical drop for your first ski day. Work your way up literally to the bigger ski mountains as you progress up the ranks from snowplow to carved turns, from green circle to blue square trails to black diamonds. 10. Remember that you can’t officially “après ski“ until you have skied – hence the expression. For more tips on learning to ski, especially how to teach your kids to ski, go to our family skiing guide section.